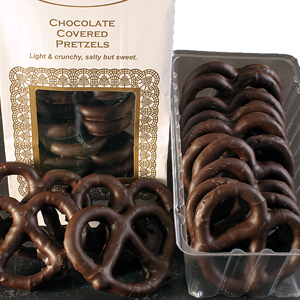 Try our large 'B' shaped DARK chocolate covered pretzels. The chocolate coating mixes well with the salty, crunchy pretzel. One bite and you’ll know why chocolate covered pretzels are a favorite of our customers. Chocolate covered pretzels are delicious for parties, as gifts or as a special treat just for you to enjoy.